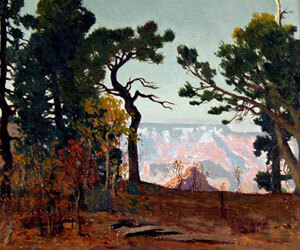 James Swinnerton, A View of the Grand Canyon, Oil on Board, 10" x 12"
Few western artists can claim the level of success in multiple fields of James Swinnerton. A painter, illustrator and pioneering cartoonist, Swinnerton's long life was punctuated by great crises and, perhaps, even better luck. James Swinnerton's first tragedy was the death of his mother when he was a small child. His grandfather, a rich forty-niner, took him into his home while his father, a writer and judge, founded a newspaper, "The Humboldt Star," in Humbolt County, California. Swinnerton bounced around between his father, uncle and grandparents as he got older until finally, at the age of sixteen, he enrolled in the California School of Art under the tutelage of Emil Carlsen. 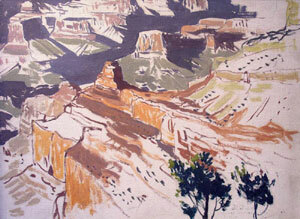 James Swinnerton, South Rim, Grand Canyon, Oil on Board, Circa 1935, 16" x 20"
James Swinnerton was a poor student but a fine artist, skipping the assignments he didn't care for in favor of elaborate caricatures of his teachers and friends. This talent for cartoons got him a position at the San Francisco Examiner, where he did cartoons of sporting events and weather forecasts. While at the Examiner he started drawing "The Little Bears," tiny variants on the bear on the California state flag. The bears started in the weather report and eventually became a major element of the paper's design, popping up in many locations and used widely in promotions. Swinnerton, sensing his growing value, asked for a raise, to $2.50 a week, which was denied. Angered, James Swinnerton left the paper. Thankfully, he had a friend who could help him find another job: William Randolph Hearst. Hearst had become fond of comics after developing a taste for German humor publications, and viewed comics as a way to increase the entertainment value of papers and, thus, their readership. As the leading cartoonist of California and, perhaps, the country as a while, James Swinnerton was an obvious choice for Hearst to bring with him to New York to revive the ailing New York Journal. The comics section of the Journal proved enormously successful and Swinnerton was hired away from the Journal by the Pulitzers' New York World and then back again when Hearst offered him a place in the color Sunday comics. James Swinnerton, Canyon Kids Racing, Watercolor / Mixed Media on Board, 5" x 9"
James Swinnerton made great sums of money in New York and spent it as quickly as it came in. He became an alcoholic and developed tuberculosis, all while his cartoon output continued to grow. Eventually he fell seriously ill and was given several months to live. Hearst rushed to James Swinnerton's aid, sending him to a sanatorium in Colton, California in order for him to be comfortable in his last days. He was not yet thirty. Neither Hearst nor James Swinnerton could have predicted the outcome of Swinnerton's trip to Colton. Over the course of the next four years, Swinnerton's condition gradually improved, and began to concentrate on sketching and painting. 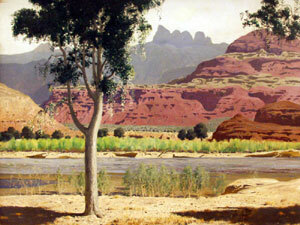 In 1907 he traveled the southwest by burro, sketching the landscape of the Arizona Desert, the Grand Canyon and southern Utah. He moved to Flagstaff for a brief period of time in order to focus on Native American subject matter, and was visited by Hearst. 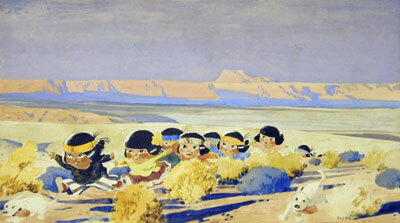 Swinnerton launched another cartoon for Hearst, "Canyon Kiddies," featuring the misadventures of young Indian children. In 1938 James Swinnerton married Gretchen Parchalls and settled in Cathedral City, California, with studios in Los Angeles and Palm Springs. His oil paintings continued to develop, and his better pieces are almost quintessential examples of western art's skillful blending of illustration and oil painting aesthetics.